Amazon’s A9 Yellow Pages search has been causing some buzz around the place, some of it from dear curmudgeonly friends suggesting it is nothing new and that there have been many projects like this over the last 6 or 7 years. I would suggest the difference is not that A9 have not just made the bear dance, but made it tango. The user-experience of this service is pretty fantastic compared to predecessors – easy-to-use and with plenty of opportunities for users to refine and feeback on the information. 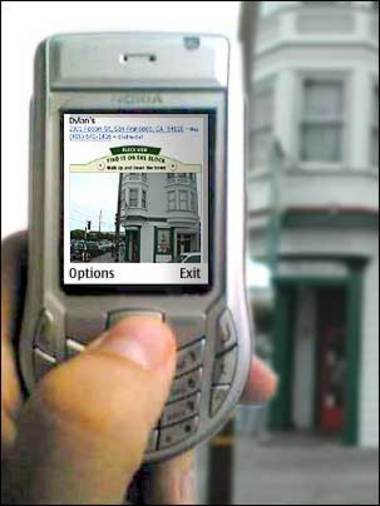 Inviting users to feedback on which is the most useful picture of a business or landmark is particularly clever, and could generate some fascinating insights for students of Kevin Lynch and other academics of urban persuasion! I guess it goes without saying that this would become a must-have service if it could be ported sucessfully to the mobile phone, especially if you were trying to find places of high digital repute with pretty anonymous physical presences. p.s. 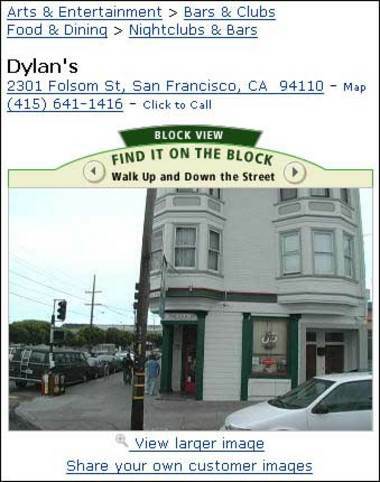 Dylans in San Francisco that I’ve used to illustrate this post is to my knowledge the only Welsh-themed pub in a world overrun by theme pubs centred around our other celtic cousins, the Irish… I went there a couple of times when the SF Sapient office was around the corner, and they gave me free beer for being able to pronounce Llanfair P.G. in full, bless ’em.